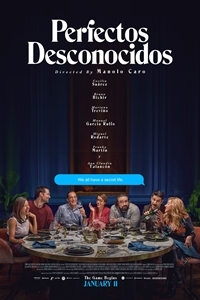 From Mexican auteur Manolo Caro comes the electrifying story about a seemingly simple dinner table game. When a group of best friends get together during a lunar eclipse to share an intimate dinner in the tasteful house of Evaand Antonio, they suspect just another typical night. All is deja vu until the hostess proposes a game- all guests must lay their cell phones on the table and read aloud all incoming messages and answer all incoming phone calls- in front of the entire group. What begins as a provocative party game quickly becomes a wild ride full of twists and "textual tension" in this electrifying over the top comedy about the secrets we all carry in our pockets.